Do you make custom patterns? Unfortunately, we do not make custom orders but we will be glad to guide you with your basic pattern amendments. We are also always happy to hear your suggestions. Is this pattern available in children size? 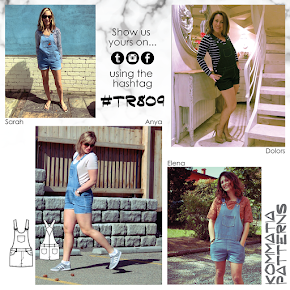 We specialize in women clothing, which means that we cannot adjust patterns for children. This is not our area of expertise. However, we have a very cool tutorial on how to add sizes to a graded pattern here. Once you have reached the desired size, we recommend you do to a muslin before cutting the pattern directly into the actual fabric. A PDF or 'Digital' pattern means that you must download and print the pattern yourself. You won't receive a paper copy! However, our PDF patterns include everything needed to construct the garment. Don't forget to have adobe acrobat installed on your computer so you can open PDF files. If you don't have if, you can get it for free here. You do not need any special printer, the pattern is divided into rectangles that fits inside a Letter/A4 sized paper. There are markers and a small scale of the pattern board to help you assembling the rectangles together. 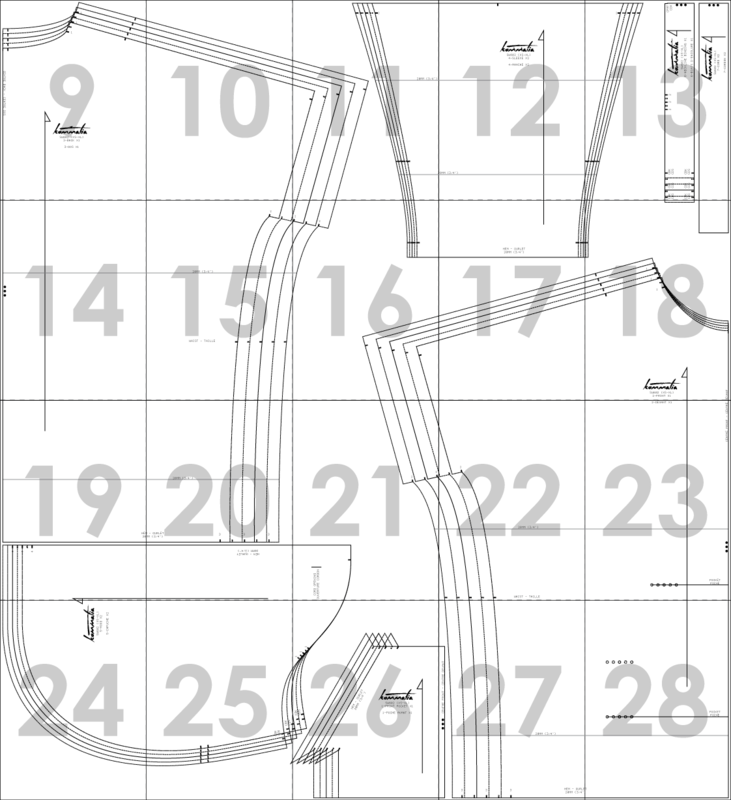 Why can't I get the test square dimensions right? There are several reasons why. First, check that you ticked the 'ACTUAL SIZE' option in the print dialogue box. Then, ensure that you are measuring your test square with a sturdy ruler. Measuring tapes are very unreliable for precision because they will stretch out with time. Then, check that you are measuring the right test square. If you are using imperial system, it's very important that you measure the square labelled '4x4in'. There is a slight difference between 4in and 10cm! If you still can't get it right, check your printer parameters. Ensure that your printer is set to the right paper size. CANADA & USA users must set to LETTER size, which can also be labelled as 8 1/2 x 11". 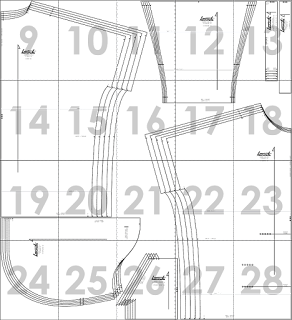 The rest of the world uses A4 format, which is 210 × 297 millimetres or 8.27 × 11.69". While you are there, double check that the 'ACTUAL SIZE' option is ticked or that the scale is set to 100%. If all of the above does not solve your problem, you will need to contact your printer manufacturer or browse on their website forum section to find other tricks as each models vary. Do you sell paper patterns? At the moment we only sell digital PDF patterns. However, if you have access to a large format printer (A0) or a plotter, you can request a special format for your pattern so you don't have to assemble the pattern board together. It's free of charge and you can request it by private message on Etsy, in the "message to seller" section when ordering or by e-mail. If you choose to send an e-mail, ensure you have your order number to hand. No matter which way you choose, you need to provide the width of your plotter so we can adjust the file accordingly. Each large scale pattern comes with a test square so you can verify that the pattern was printed in the appropriate scale. 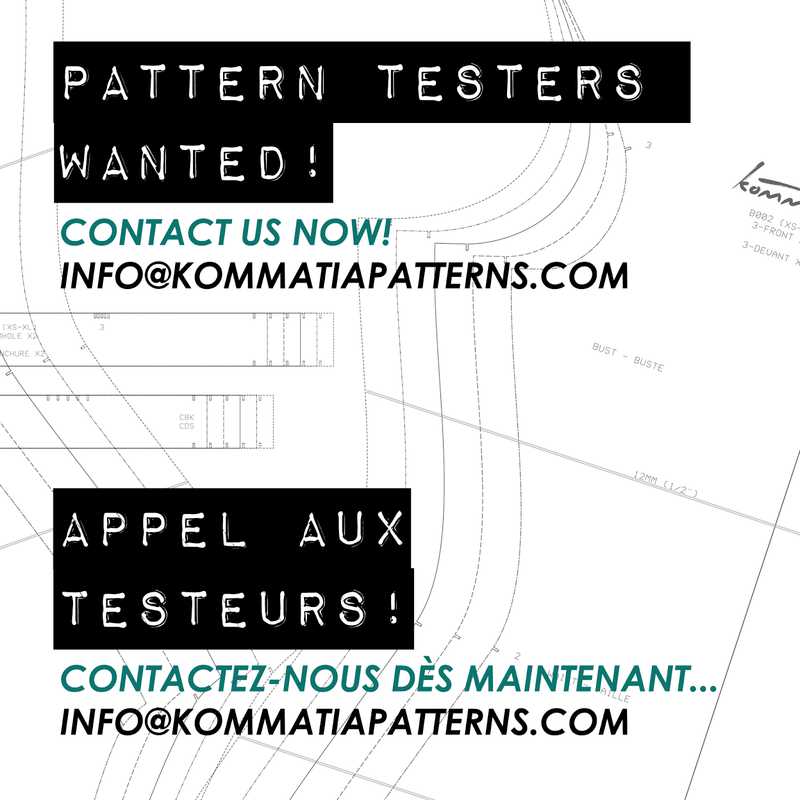 Do you have pattern testers? Yes! All our new patterns are tested to improve the fit of the garment and to make the instructions as user-friendly as possible. We are always happy to add new testers to our list so if you would like to become a tester, download this document with more info, no need to be a professional to apply! Do you update your patterns? Every now and then we will look into our older styles to see if we can improve the fit. We always take note of our customers suggestions thus we often update the pattern format and sewing instructions accordingly. If buy a pattern and an update is released, the new version is available to you, free of charge. ETSY: you will be able to download it again in the "purchases and reviews" section. CRAFTSY: nothing to do here, Craftsy will send you the pattern by e-mail. Otherwise, just write us an e-mail including your order number. If you have more questions to ask us, please send us an e-mail at info@kommatiapatterns.com or click on the 'contact' link in the navigation tab! Welcome to our blog! We offer a wide range of sewing pattern in women size to help you build your own wardrobe. On the blog you will find various tutorials and article to improve your sewing techniques. To shop our style, visit our two shops on ETSY and CRAFTSY. Nos patrons sont aussi disponibles en Français sur le site de Makerist.fr !